Being Frugal and Making It Work: February #LoveMe Challenge: Day 12! I know that we all have flaws, imperfections and insecurities. How we choose to deal with them, has a great impact on the person we are and how we treat others. Day 12 in the #LoveMe Challenge is to share one of my flaws. Just one? What is the #LoveMe Challenge? The #LoveMe is a challenge to love yourself. Everyday there will be a prompt for you to look at yourself, embrace who you are, and hopefully help you learn that you are beautiful, you are amazing and you need to love who you are. How do you participate in the #LoveMe Challenge? Everyday during the month of February, there will be a different prompt. You can share an instagram, a tweet, a blog or a video that was inspired by that prompt. Just make sure if when you share add the hashtag #LoveMe. The #Love Challenge originated over at Pepper Scraps, to learn more and join us - be sure to check it out! 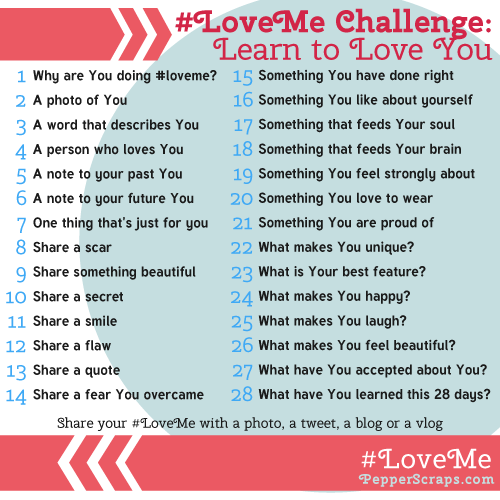 By joining the #LoveMe Challenge today, you can learn more about yourself by sharing with others.